I work strictly on a reward basis, that means you pay what its worth to you and what you can afford to have me find your lost ring, but a big smile is always required. 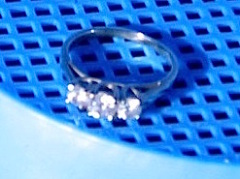 I do have a call out fee of $20 for some areas if the ring is not found, this covers my fuel expenses. We can discuss this when you call. beach, sand or cobble, dry and wet, Lake shores, yards, garden paths, public right a ways. I’m a big guy with just as big of a desire to help you find any lost and treasured rings, necklaces, ear rings, car keys from the beach or ocean surf and see the smile on your face with a recovery. I have been a life long treasure hunter and a metal detectorist for over 15 years. I know the Central Coast and its complex intricacies of beach dynamics quite well. I grew up here and this area has been my playground and work area all my life. I use top quality water proof equipment with many options at my disposal, including a yearly “day pass” to the Oceano Dunes State Vehicular Recreation Area, aka; Pismo Beach. I have a four wheel drive vehicle to get back into the dunes if needed. contacting me ASAP really goes a long way in helping with recovery along with my tips on what you need to do in helping with a successful recovery.